What do you do when you've co-headlined one of the hottest metal touring packages of 2017? Well, like any rock band that cares about its fans, you do it again, but you take it to the places that missed out the first time. And that's exactly what metalcore masterminds KILLSWITCH ENGAGE and legendary thrash/metal masters ANTHRAX are announcing today — "KillThrax II", a twenty-nine-city tour of North America presented by SiriusXM that kicks off January 25 in Montreal, Canada and will zig-zag across the continent to wind up in Portland, Maine on March 4. 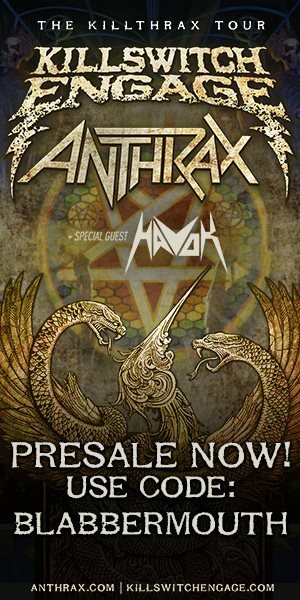 HAVOK will serve as the opening act for the entire tour. 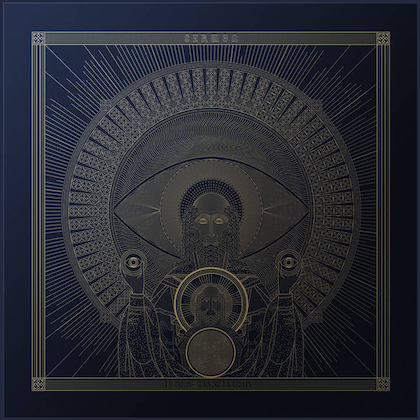 Said ANTHRAX bassist Frank Bello: "After playing so many amazing shows last year with our friends KILLSWITCH ENGAGE, I'm psyched for round two of 'KillThrax', and we're adding HAVOK to the heaviness!!" Drummre Charlie Benante added: "The shows were great, the audiences were great, and we all felt great about the whole thing, so why not do it again?" "'Evil Dead II'. 'Dawn of the Dead'. 'The Godfather: Part 2'. 'The Empire Strikes Back'. All sequels that are better than the original. Add 'KillThrax II' to that list. Back by popular demand, 'KillThrax' is coming at ya again my friends," said ANTHRAX guitarist Scott Ian. 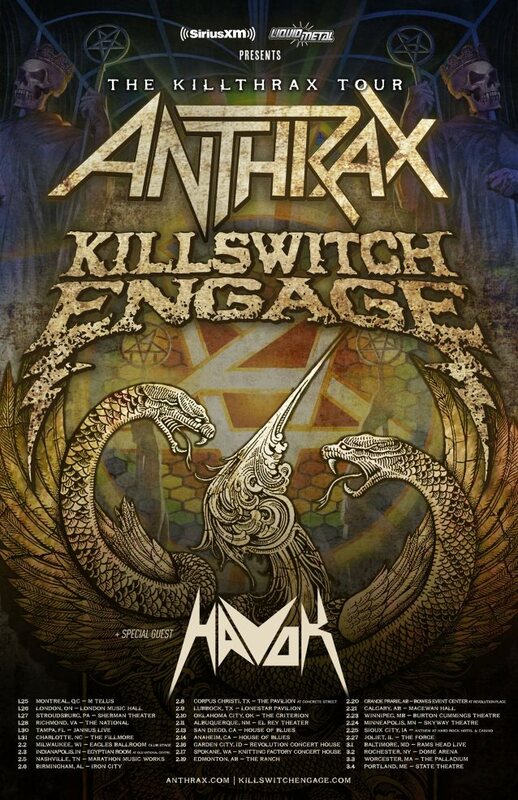 "We are looking forward to the next leg of the 'KillThrax' tour," said KILLSWITCH ENGAGE singer Jesse Leach. "We had a blast on the first one and we enjoyed sharing the stage with the humble legends ANTHRAX! There is such a synergy between the two bands and a certain unity that is infectious, so it was a no-brainer to put this package back together and hit the road. It's an honor and we are excited for these shows, the fans, and the good times! 'KillThrax' is gearing up for round two, so let's keep the party rolling!" 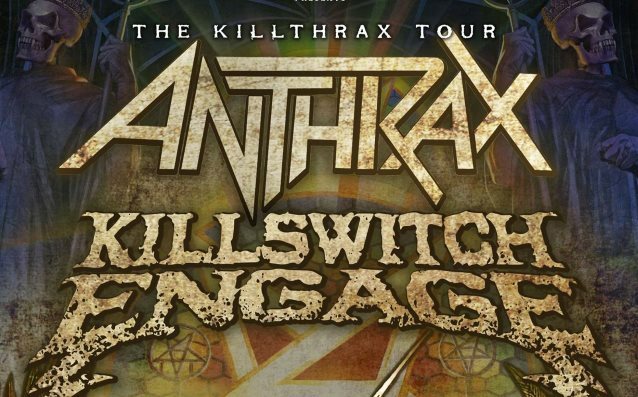 As with the inaugural "KillThrax" tour, KILLSWITCH ENGAGE and ANTHRAX will rotate the show's closing slot on "KillThrax II". 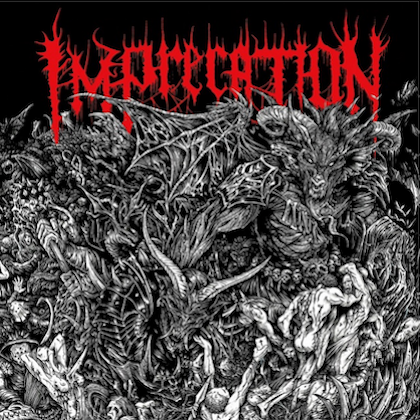 Fans can also expect a night of high energy, musical ferocity and sheer intensity, and what one reviewer called "an incredible night of live music with heavy hitters that provided hours of escape into metal bliss." A special BLABBERMOUTH.NET presale for all shows will begin on Wednesday, October 18 at 10:00 a.m. local time and end on Thursday, October 19 at 10:00 p.m. local time. When prompted, type in the presale code "BLABBERMOUTH" to access tickets before the general public. The general on-sale for U.S. dates is Friday, October 20 at 10:00 a.m. local time. Confirmed dates for "KillThrax II" are below.